one of them, anyway . . . If they used single bills like the rest of us, they’d gain some perspective. 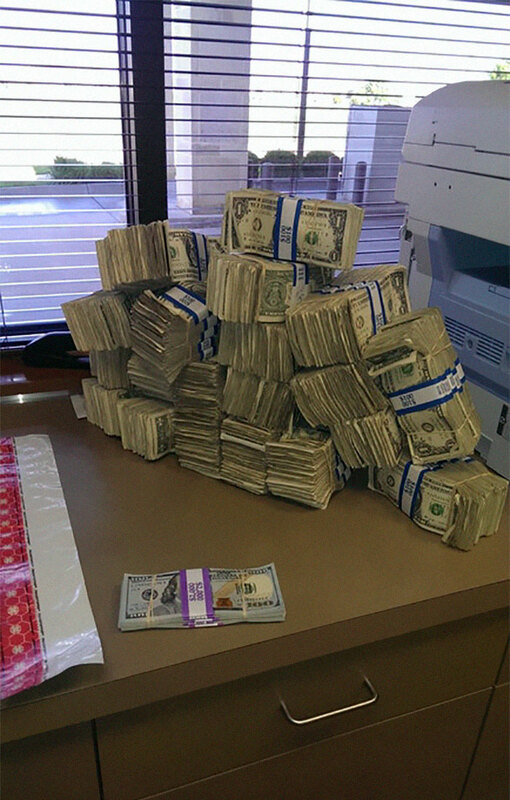 Here’s $10,000 in ones and hundreds. Speaking of perspective, here’s a little trick I teach my clients to help them understand wealth: Write down the price of any item on a sheet of paper. To see that thing from the perspective of wealth, move the decimal point one place to the left. A five dollar Starbucks concoction becomes a fifty-cent treat and that new iPhone is a painless $150 weekend splurge. That’s all the impact it has on their bottom line. Now, go back to the original prices and move the decimal point one place to the right. An iPhone suddenly feels like a mortgage payment and that Starbucks just turned into a fifty dollar spending spree. That’s how big a bite those purchases would take out of someone near the poverty line. If your brain can handle it, try moving the decimal two places to the left and right. Billionaires and severe poverty are currently ubiquitous, so a meditation on how each might shift an individual’s beliefs about the world is valuable.